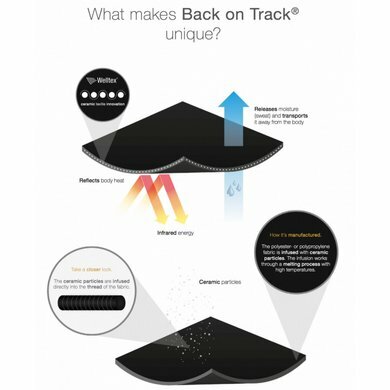 The Back on Track 3D Mesh Brushing Boots offer a unique combination of protection, quality and well-being. The soft neoprene lining with shock-absorbing open-mesh outer layer makes the protectors very breathable. 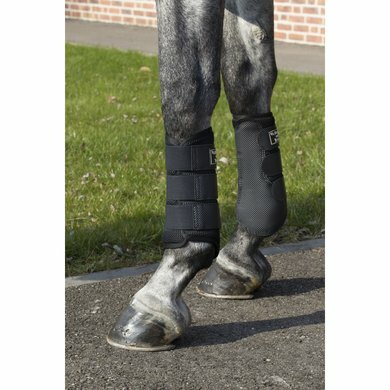 These all-round tendon boots are suitable for both the front and rear legs and are easy to use with adjustable Velcro. We advise to take a size larger than before for the hind legs. Available in black and white, in sizes S, M, L and XL. 86% would buy this product again. 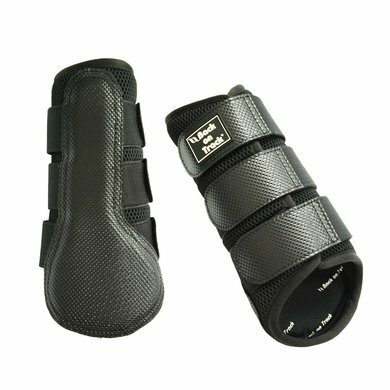 Fine protectors, legs are not as warm as under normal tendon boots. For my kwpn of 1.65 I really did not have to have a larger than an M.
I have sent my bot brush boots back because of the size. I have a 1m62 horse with normally a cob or M of leg protectors but here M was really too big. Even though I measured them they were still too big. I sent them back. unfortunately the S was not in stock and I did not order it anymore because I had to wait 2.5 months on the M.
I did not find them firm and did not use them but sent them back. I had expected them to be firmer. Probably the description is not read well enough. Answer: Size S corresponds to 25cm.